What if there was a powerful natural elixir that can relieve indigestion, make you more energetic and preserve youth... has been taken around the world by scores of people for thousands of years... and costs a whole lot less than expensive pharmaceuticals. It's for real, and available at your local grocery store. What is it? 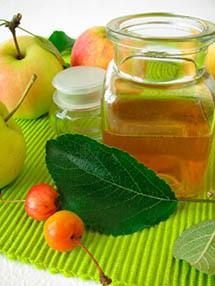 Good old-fashioned apple cider vinegar (ACV)! This tart tonic has been used for centuries in many different countries, for a variety of uses and conditions. And the good news is that the science behind it is sound. As revealed in a study published in Diabetes Care, researchers discovered that Type 2 diabetes patients who took two tablespoons of apple cider vinegar at bedtime showed favorable changes in blood sugar levels the next morning. In a study published in a foreign medical journal, scientists found an apple cider vinegar-enhanced diet may increase in HDL (good cholesterol), and reduce levels of triglycerides – a harmful type of blood fat. When you consider the benefits of apple cider vinegar listed from thousands of years of history, this is a natural remedy worth considering. Here are even more benefits! Gives you more energy while decreasing recovery time from workouts. ACV has compounds that counteract lactic acid buildup in the muscles after exercise. Gargling with ACV can kill bacteria in your mouth and gums and give you whiter teeth. If you have diarrhea caused by bacteria, sipping water with ACV can be just what the doctor ordered. The apple pectin can also soothe intestinal spasms. To cure a case of the hiccups, take a teaspoonful of pure ACV. The sour taste will stop it in its tracks. To prevent indigestion or heartburn, take a teaspoon with a glass of water 30 minutes before your meal. Nighttime leg cramps can be relaxed when you add two tablespoons of ACV with honey to a glass of warm water. Good ACV will look dark and murky, with a cobweb-like substance floating in it known as the "mother" (or the culture). This contains a number of beneficial living enzymes, which are responsible for most of the health benefits from apple cider vinegar. When you take ACV with a 12-16 ounce glass of water, you can add honey, lemon, and/or Stevia for taste. Once you experience the health benefits of apple cider vinegar – higher energy levels, better digestion, or relief of leg cramps at night (getting longer, less interrupted sleep) – you'll actually look forward to making apple cider vinegar a part of your daily health routine. Are there any side effects to taking this natural supplement? Since it's a natural product, the health risks of taking apple cider vinegar are very low, especially when compared to the possible side effects of synthetic pharmaceutical drugs. If it can possibly help one or more health ailments... and there's very little downside... why not give good old apple cider vinegar a try? While ACV isn't a panacea, it has the potential to relieve a variety of medical conditions. It's a versatile, inexpensive remedy that can improve the quality of your health and life.